We’re exhausted. 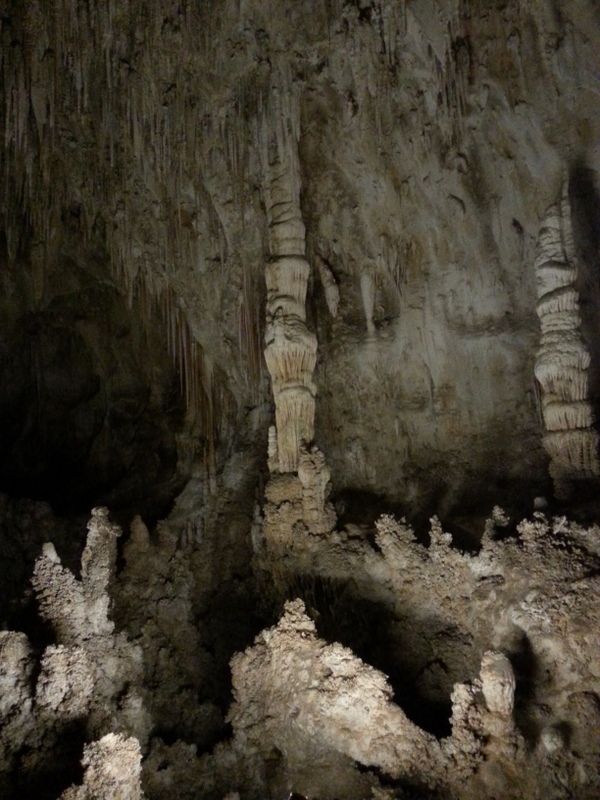 Spent the day at Carlsbad Caverns National Park investigating the enormous cave/cavern (not sure what the difference is). Although not the largest, deepest, or longest cavern in world, it certainly holds its own. 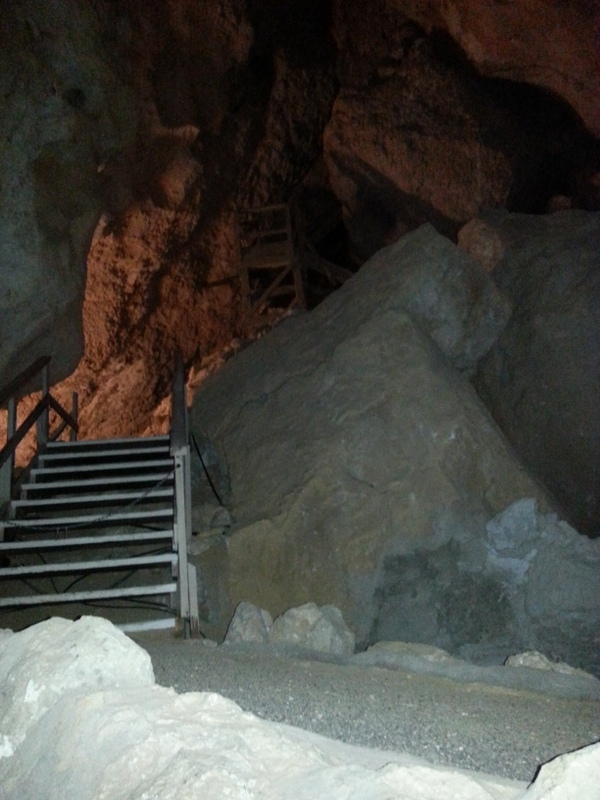 Choices for tours were limited, so we elected to on the self-guided tour, assisted with a rented audio device to supplement the signage in the cavern. Take the elevator down to the Big Room? Oh no – not for us! 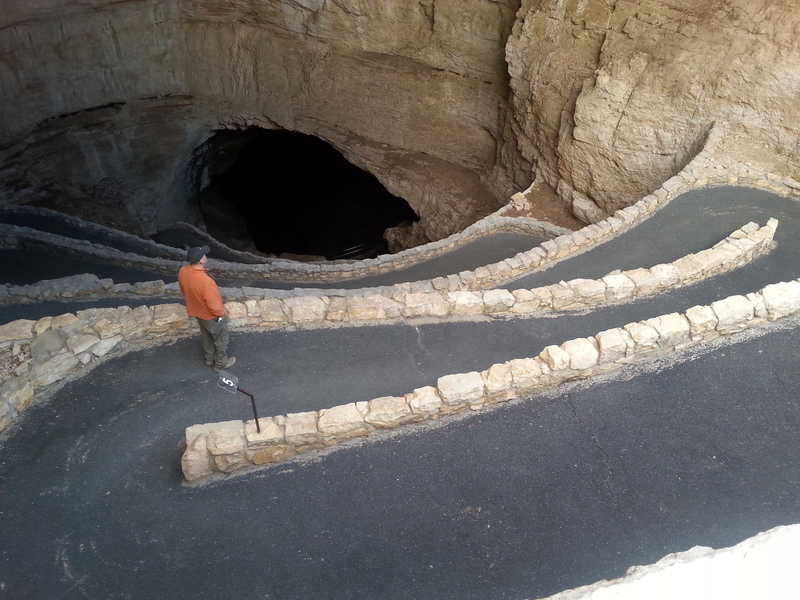 We went down the Natural Entrance, going down approximately 800 feet in a mile of walking. Not too hard, but there certainly are some steep patches. Once past the area where there is any natural daylight, it gets interesting. Some of the older pathways are still intact – these featured stairways instead of the gradual sloped paths that are used today. The tours must have been pretty difficult for the average tourist, as 800 feet down (then back up) via stairs is nothing to sneeze at. Too bad for us that it’s the wrong season to see the thousands of bats which summer here. Since they winter in Mexico, we missed seeing them flutter out of the cave at sunset to hunt for food. It must be a spectacular sight. The photos in the Visitor’s Center of this event are intriguing. 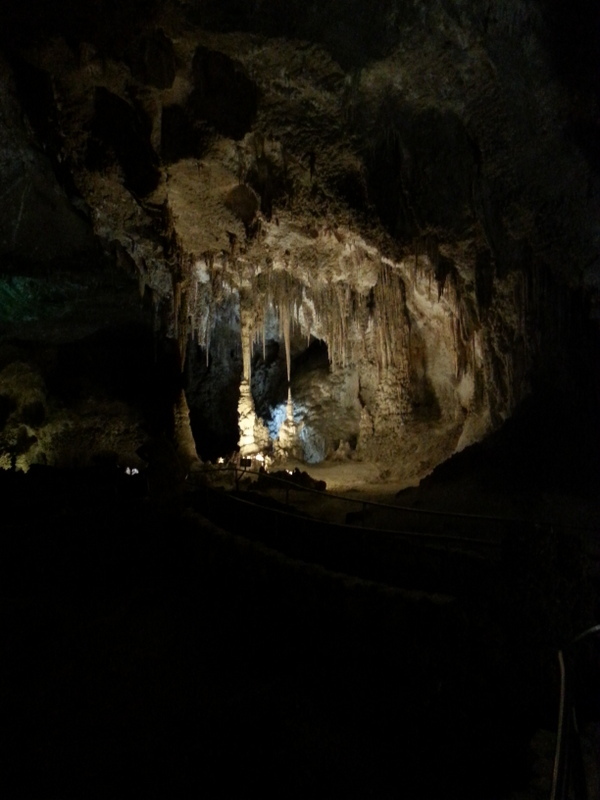 Once in the Big Room, we wandered along the pathway for another mile and a half or so, checking out the spectacular limestone formations. 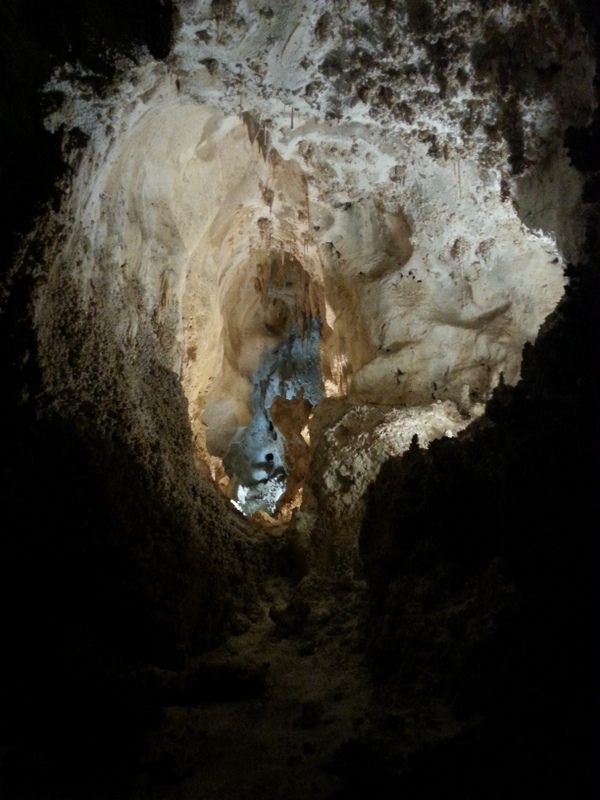 The Cavern both soars overhead and plunges into holes that appeared to be bottomless. It’s really difficult to imagine how the early explorers managed as well as they did – heading into this cavern with whatever lighting and ropes they had. Certainly not a job for the timid. One of my favorite areas showed a ladder staked into the wall where a 1985 National Geographic team explored for six months. A really great way to spend a day. 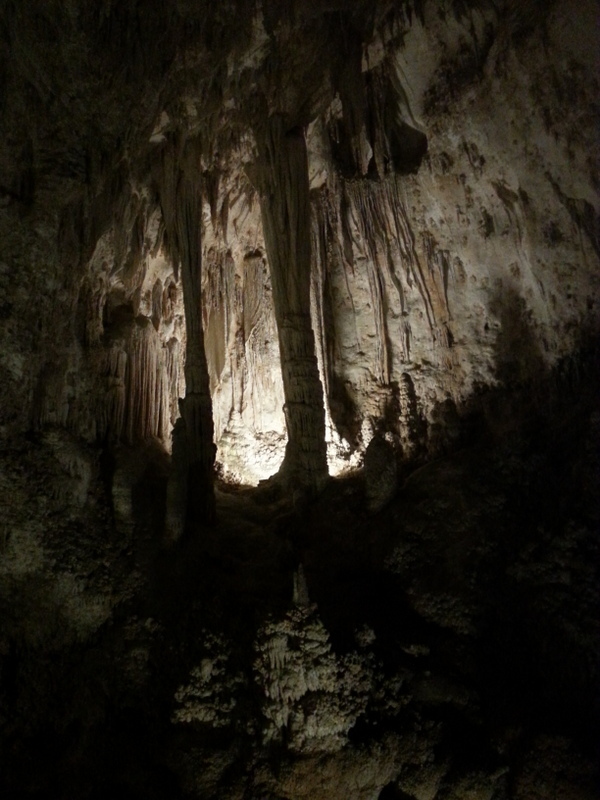 But, having seen Carlsbad, Kartchner Caverns, and Mammoth Cave, I might be done with caves. We foolishly decided to walk back out the Natural Entrance, instead of taking the elevator up. Whoo boy! That was an effort! The gentle slopes downward were quite a workout in the opposite direction. We like our camp at Brantley Lake State Park a lot. The sites are huge, and are staggered, so even if all the sites were full, there would still be a sense of privacy. 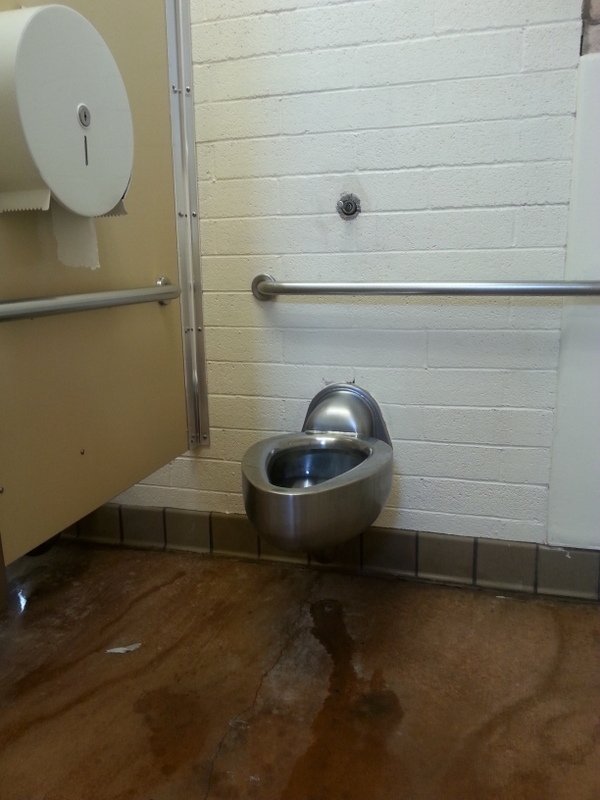 My only complaint though – the bathrooms are very weird. More like something you’d find in a prison (and I only have movies to guide me on this one). Seems like they could do a bit better than this. Oh well……tomorrow we move on. This entry was posted in camping, national parks, New Mexico, retirement, simple camping, state parks, Texas and tagged camping, historic sites, national parks, New Mexico, simple camping, T@DA, the great outdoors by Judy Crankshaw. Bookmark the permalink. Your photos are absolutely gorgeous! Thanks for sharing! We just moved from that part of the country. My husband and I worked at Guadalulpe Mtns. NP. If you like to hike it’s worth the effort to continue west about 33 miles and take the hike down Devil’s Hall or McKittrick Canyon. Either can be done in about 4 hours! They are worth the effort! Thanks for the info. I think we have already passed Guadalupe Mtns. NP, as we are at Oliver Lee Memorial SP in Alamogordo heading toward the Chiricahua National Monument. It’s such a gorgeous area – you must miss it. Will save your suggestion for our next trip thru. Don’t know why we are in such a hurry. We miss much more than we manage to see! You must be following us!! LOL The parked we moved to is Coronado Nat’l Memorial which is just down the road from Chiricahua. My husband works between the three parks: Chiricahua, Coronado and Ft. Bowie. This part of the country is unbelievable. Safe travels and enjoy! We enjoy the southwest so much. It sure isn’t Michigan! 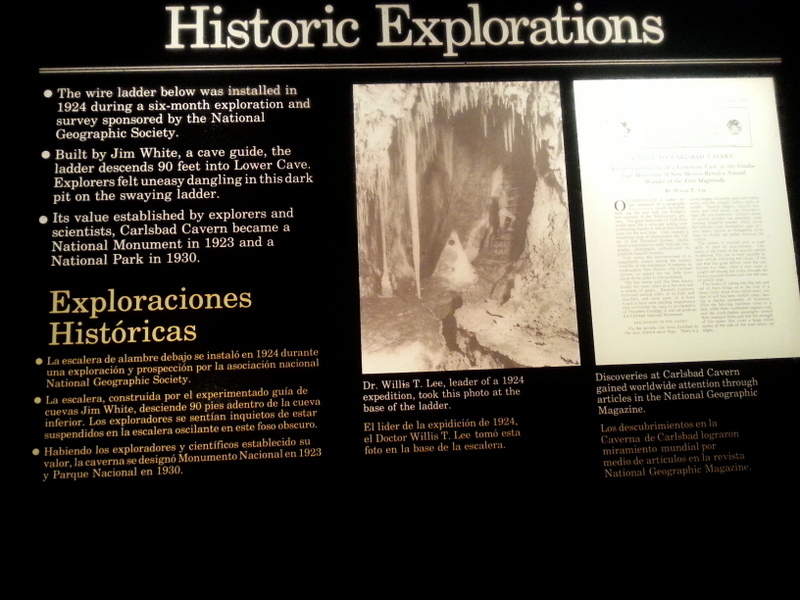 I love exploring caves, old mines, caverns, etc! Mammoth was the whip! We only did a brief self tour at Mammoth, and it didn’t show us anything spectacular. 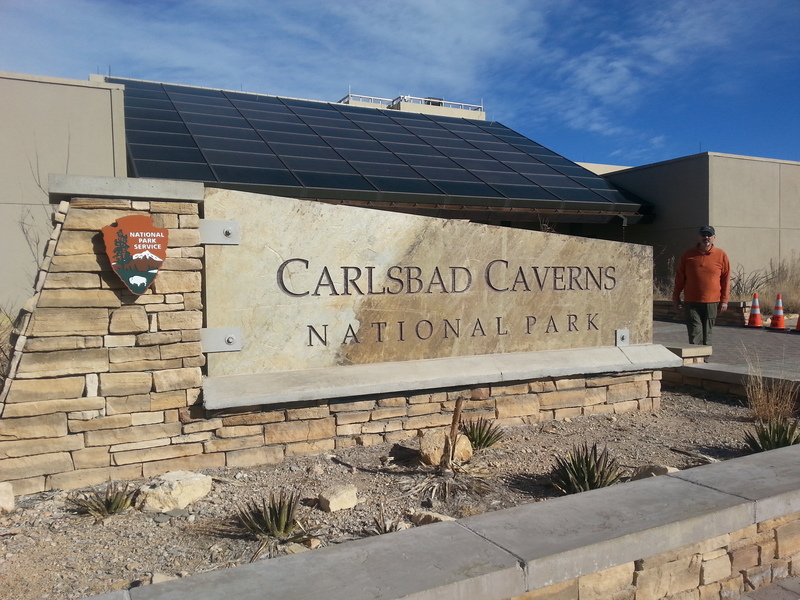 At Carlsbad, they have several specialty tours where you crawl around on your belly, etc. Not sure if I’d brave enough for that or not. I generally need to be able to see an exit wherever I go. I’d be a better skydiver than spelunker. 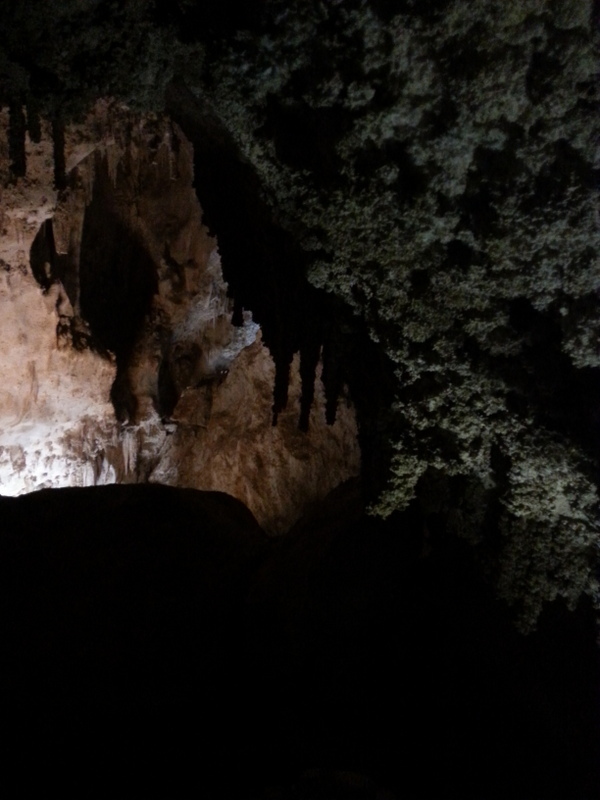 It sounds so odd to describe exploring caverns in terms of miles. That photo of the rickety vertical ladder is almost enough to set off a bout of vertigo! Even getting TO that ladder would have been very treacherous. 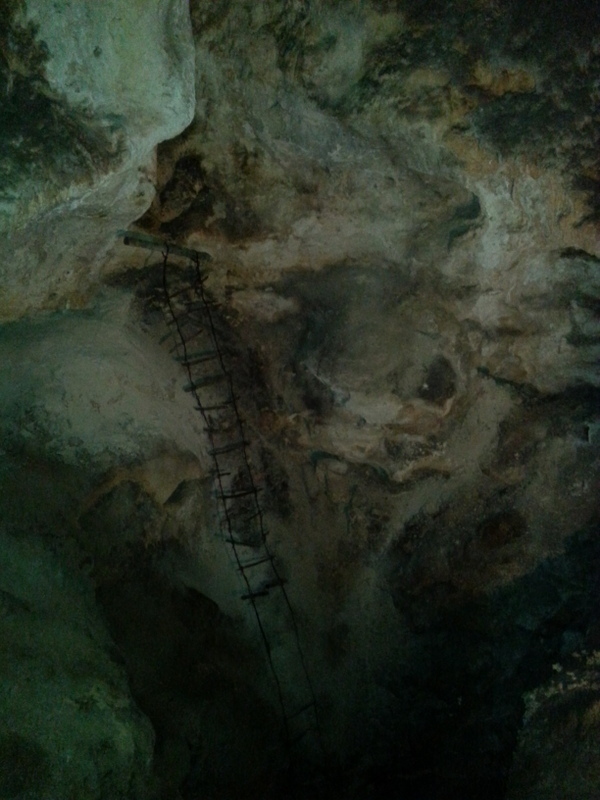 Being a caver would require nerves of steel. Warm, but not warm enough….. If you catch my drift. Beautiful and fascinating. I’m impressed with your strength and stamina. Hope your legs don’t hate you tomorrow. My legs were happy for the workout. We’ve been pretty sedentary lately. No snowshoeing for us! 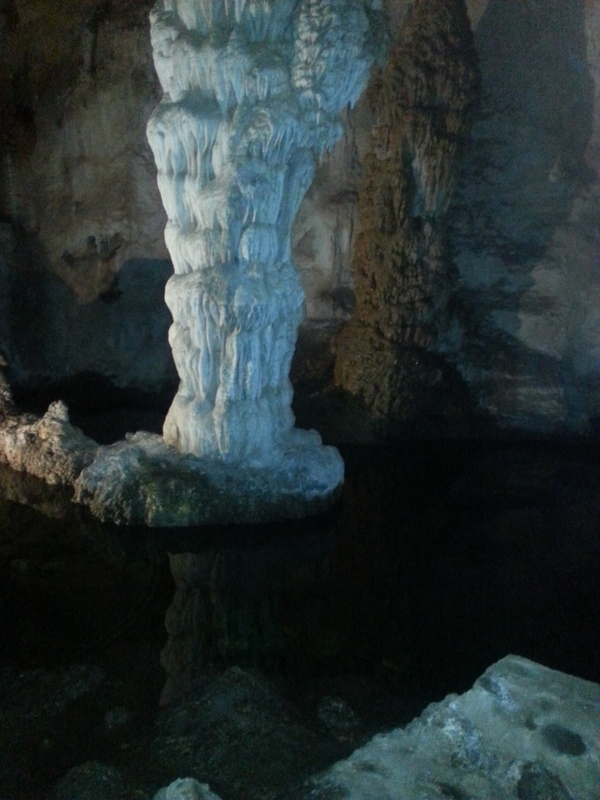 The caverns look really cool, have they installed lights, or are you groping around in the dark most of the time? There are lights. Dramatic spot lights and accent lights, but overall it’s quite dim. I wound up discarding most of my camera’s flash shots because they were so bright, and wound up with just a few where there was adequate light to see some detail.